Best Mac Video Converter for iPad/iPhone 4/iTouch 4. Transcode HDV/AVCHD to ProRes, AIC,etc. The Panasonic 700 series includes three models of HD camcorders: HDC-SD700K, HDC-TM700K and HDC-HS700K with 3MOS sensor for high quality videos and images. The Panasonic 700 series can record 1920x1080 videos with 60 fps 28Mbps in progressive mode and AVCHD compliant 17Mpbs videos. However, DVD player does not work with the native .mts files, and we should burn Panasonic SD700/TM700/HS700 to DVD. It is great to know that Aunsoft Video Converter for Mac works with 1080p videos from Panasonic 700 camcorders. It is no longer a hard task burning Panasonic videos to DVD with iDVD. 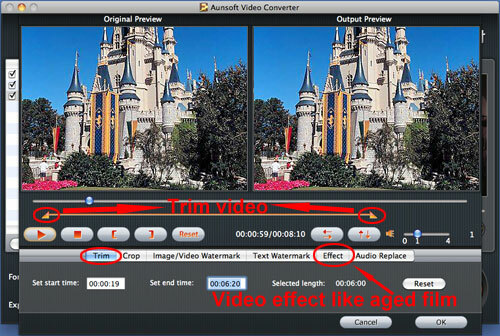 The Mac Panasonic video converter also includes fast video editing functions like trimming/splitting, merging/joining .mts before importing to iDVD. Follow the steps below, and you can find it easy to burn 1080p videos to DVD for playback on DVD player, which is hooked with TV. Step 1. 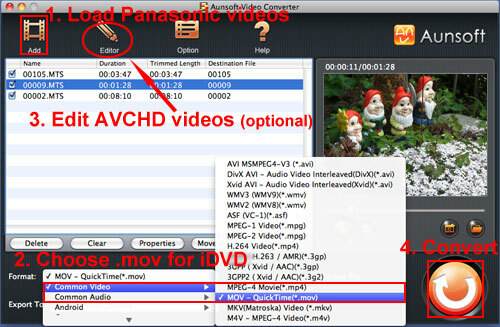 Load Panasonic HD videos to Aunsoft Video Converter for Mac. Copy and transfer Panasonic SD700/TM700/HS700 HD videos to iMac/MacBook Pro hard drive disk via USB 2.0 cable. Run Aunsoft Video Converter for Mac as the fast Mac Panasonic HD video converter, and click the "Add" button to load .mts videos. Alternatively, you can go to the folder with the .mts files, and drag and drop the videos to the application UI. Click the "Format" option, and choose Common Video > MOV - QuickTime(*.mov) as output format. The Mac Panasonic video converter will convert 1080p HD video footage to MOV with original 1920x1080 resolution. Select a video footage, and click the "Editor" button, you will face the following window to trim and crop video, to add watermark to video, and even change the filter effects of video to aged film. Step 4. 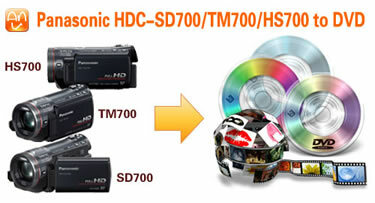 Convert Panasonic SD700/TM700/HS700 videos to MOV for iDVD. Click the convert button on the bottom-right corner of the application UI, and the Mac Panasonic video converter will start converting Panasonic SD700/TM700/HS700 MTS to MOV for iDVD in batch. When the conversion is done, run iDVD to create a project and load the .mov videos to the iDVD project. The SuperDrive on iMac/MacBook Pro/MacBook Air or Mac Pro works with DVD±R DL/DVD±RW/ CD-RW. Thus, you can insert a blank DVD-R to the Apple bundled DVD drive, and click the "Burn" button on the bottom of the iDVD to start burning videos to DVD. Go to the Panasonic camera column for more Panasonic camcorder models and solutions. From my first use and impression of the software I see it has a well designed interface and easy to use. It has large number of file format to convert to (I liked it). Your product is excellent. I was very happy with the results of the conversion of Mod files and HDV (MTS) files. Aunsoft does what I need beautifully. I LOVE your converter. And your demo was REALLY a great way to see if it was going to fulfill my needs. When it worked so beautifully, I instantly grabbed my credit card and bought it.